NEW YORK, NY.- Joan B Mirviss LTD opened the exhibition, Into the Earth: The Clay Art of Ogawa Machiko, the gallery's third solo show of this female master, a force in the Japanese art world. Featuring two main bodies of work, the show focuses on her minerology and torn sculpture series. A longtime collector of rocks and minerals as a result of her extensive international travels, OGAWA MACHIKO (b. 1946) equates the joy she feels from her creative process to that of a miner, who after years of excavating, at long last discovers a vein of ore. 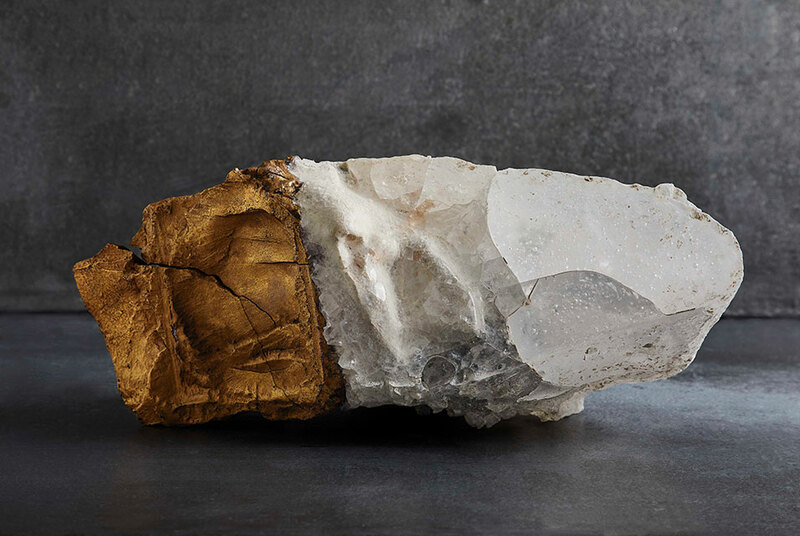 Her mineralogy series pays tribute to such discoveries with each fragmented rocklike sculpture seemingly hewn from the depths of the earth and embedded with crystals in its matrix. In fact, they are created through patient sculpting and multiple firings using different clays, varied forms of glass, and added minerals. Contrasting with these solid rocks, the Torn Sculpture series suggest broken primitive receptacles, unearthed during an archaeological dig and weathered by the elements. Within each fragment, the flowing or pooling glass glaze appear as if water has crystalized onto the surface while buried deep in the earth. In both series, Ogawa uses the warped and fissured texture of the clay body to suggest a desert floor, a mesa boulder, a polar cave or the deepest caverns under a mountain. Avoiding deliberate primitivity, yet inspired by a sense of liberation from the narrow, hallowed strictures of lifelong training in the use of wheel and kiln, Ogawa does not so much use clay to achieve self-expression as make herself the means through which the clay reveals its inner strength, a process that she sees as one of self-discovery, an interjection of traces of humanity into evocations of the earths geologic cycles. --Joe Earle, 2018, former Director of Japan Society Gallery and former Asian art department head at the Victoria and Albert Museum, London, and the Museum of Fine Arts, Boston. Ogawa Machiko has been a vital force in the dialogue of contemporary clay since her arrival on the scene in 1985. After study at Tokyo University of the Arts, she drew inspiration from her travels, which included living and studying in Paris at the École dArts et Métiers and then in Burkina Faso in West Africa. Winner of the Japan Ceramic Society Award as one of only six women to receive this prestigious prize, she has been the subject of numerous solo exhibitions at major galleries and museums throughout Japan. Her work was featured in two seminal US exhibitions: Touch Fire: Contemporary Japanese Ceramics by Women Artists in 2009 and Contemporary Clay: Japanese Ceramics for the New Century in 2007 and is in the permanent collection of major museums throughout the world including National Museum of Modern Art, Tokyo; Museum of Modern Art, Kamakura; Suntory Museum of Art; and in the United States at the Los Angeles County Museum of Art; Minneapolis Institute of Arts; and Museum of Fine Art, Boston. OGAWA MACHIKO is the second of four monumental ceramists whose art, impact, and legacy Joan B Mirviss LTD is celebrating between September 2018 and May 2019. The first exhibition, Shifting Rhythms this September focused on one of two other women masters, KOIKE SHOKO (b. 1943). The second, FUJIKASA SATOKO (b. 1980) will be showcased in May. In March, our ground-breaking Asia Week exhibition will center on TOMIMOTO KENKICHI (1886-1963) who has been considered Japans most influential ceramist of all time.